"LeBoeuf's gorgeously painted figurative canvases depict complex relationships and open-ended narratives. The beauty and enigmatic subject matter of the paintings engage the viewer emotionally and intellectually. We empathize, identify, and wonder. What is happening? What will happen next?" Bryan LeBoeuf featured in quarterly review that places art before the reader's eyes and invites thoughtful responses. 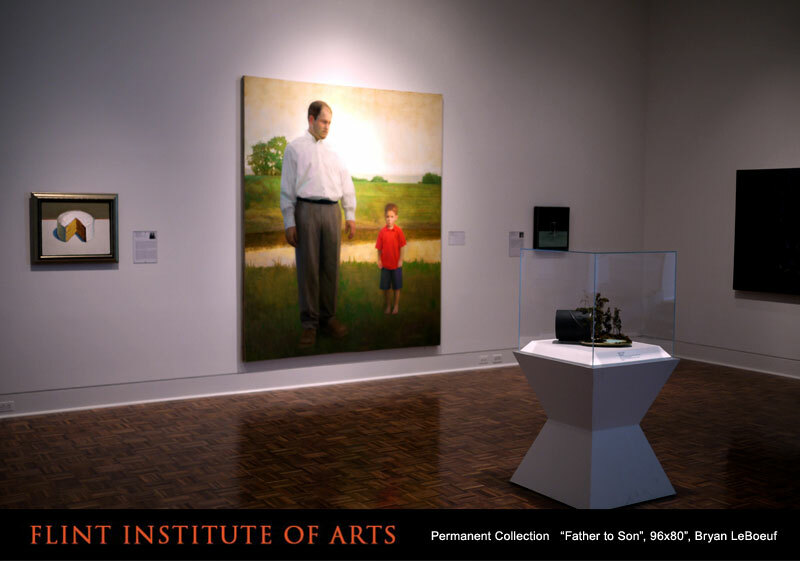 Augusta museum features work of emerging figurative artist. "LeBoeuf faced the challenge of depicting figures as seen through a tinted winshield; such technical mastery alone would impress the viewer if it were not for the additional element of mystery that the artist supplies." "The Louisiana-born painter Bryan LeBoeuf displayed his facility with oils and anatomy in this strongly figurative show. A number of the paintings dealt with the artist’s memories of the South and bore hints of menance in dramatic scenes intensified by the incompleteness of their narratives." "The most persuasive works are by those artists who are not straining for style. Painter Bryan LeBoeuf’s “Trois Bateaux” (2004), the centerpiece of his recent solo show, gives evidence of maturing to certain artistic convictions — something quite different from style. He combines sympathy for the human figure with a quirky, mildly surreal compositional wit." "LeBoeuf’s Seductive Power—Eerie, Familial Paintings. His knowledge of the human form, agility at manipulating oils and eye for the checks and balances of composition will draw “oohs” and “aahs” from New Yorkers resigned to the the notion that they don’t make painters like they used to. Mr. LeBoeuf’s pictures of sons and fathers, brothers and sisters, women bathing and men sleeping are narrative fragments imbued with a strong sense of place."